Landing in a small plane on a grass-covered runway in the middle of a jungle is the quiet part of Ann Hagensen’s journey to Africa. Because once the doors open, she and the traveling medical team are welcomed by throngs of locals from Karawa, a remote city in the Democratic Republic of the Congo. Last February Ann, a registered nurse and Virginia Mason Patient Relations project manager, made her second journey to Karawa accompanied by five volunteer physicians. The group represented the Medical Ambassador program of the Paul Carlson Partnership, an organization dedicated to medical and economic development in the Congo. The group’s mission was to train local nurses and doctors in methods of trauma care. Systems of care that are routine for medical teams in developed countries like the U.S. – such as standards of triage for multiple trauma cases – don’t exist in central African hospitals, where simply maintaining basic supplies is a daily challenge. Ann and the team worked from manuals provided by the World Health Organization, specially created for these hospitals and their limited resources. The Congolese professionals who receive training return to their clinics and hospitals, where they will train dozens more medical staff, equipped with the manuals and needed supplies. This “train the trainer” model means one medical ambassador can eventually train about 100 people across multiple facilities. Ann scheduled her first trip to Karawa in 2012, after hearing about the work of the Paul Carlson Partnership at her church. Ann did rounds with a physician’s assistant, a resident missionary who was starting a nutrition program. To get growth data after adding moringa (a protein-rich plant) to children’s diets, Ann helped teach nurses how to obtain an accurate body weight and measure the circumference of the young patients’ arms and legs, explaining the importance of tracking results as the moringa increased their muscle mass. Ann was struck by an observation on that trip: the region’s medical system was run by nurses. Twelve doctors cover five hospitals and 104 clinics, with most clinics staffed by only one nurse. By necessity, many nurses learn to perform surgical procedures, like C-sections and appendectomies. Ann decided nursing education must be the focus of her ongoing partnership work. 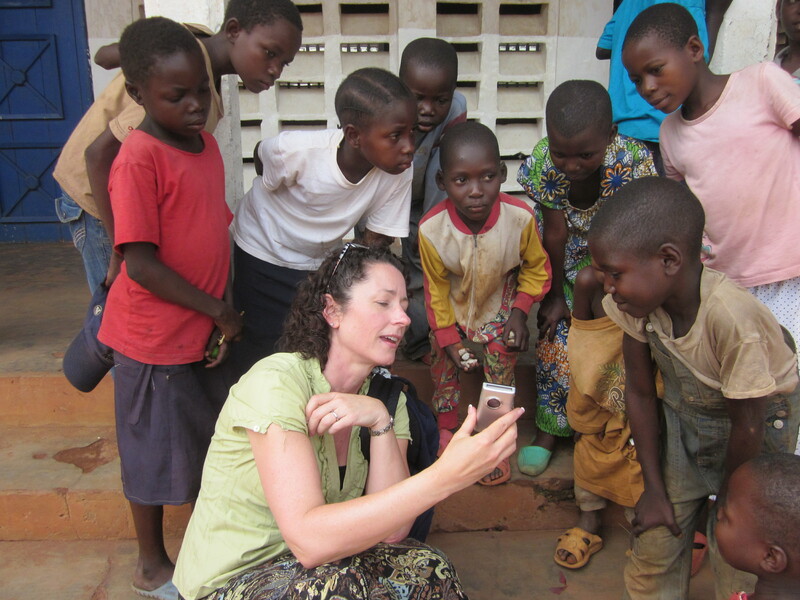 Ann spends time with the local children. Today Ann leads the Nursing Focus Group, comprised of 16 nurses across the U.S. who meet online once a month. 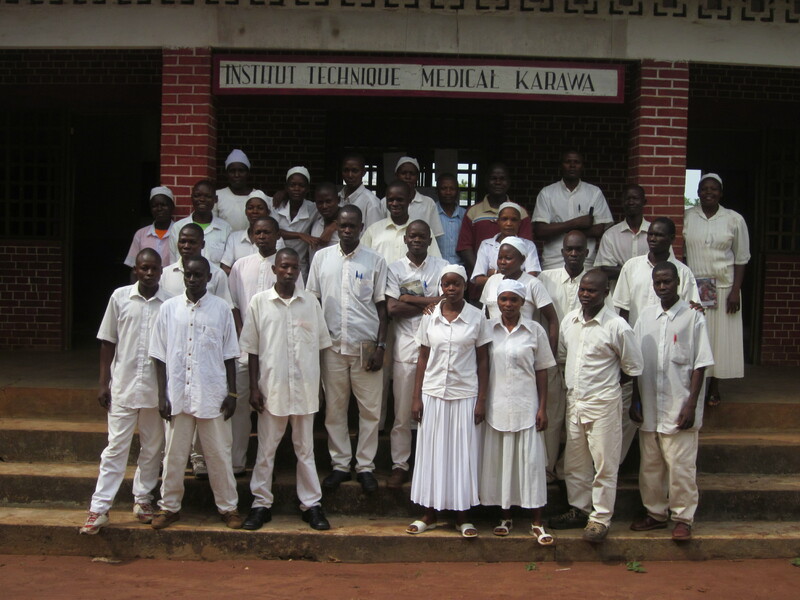 The nurses divide their efforts between curriculum support, fundraising and obtaining supplies for the nursing schools. There are two schools now: a university level program for nurses was added in 2013. A recent supply shipment to Karawa contained stethoscopes and blood pressure cuffs, to help stock the nursing students’ new “learning lab,” a dedicated teaching room Ann helped provide to increase student resources on her last visit. When Ann arrived in Karawa for her second trip, over and over people would touch her and say, “Thank you for not forgetting us.” Ann marveled at their immense gratitude in the face of unrelenting need. Truly amazing selfless, productive work.